Tony Blair: Time is running out Jump to media player "Time is running out" to resolve the Gaza conflict according to Middle East peace envoy Tony Blair. 'Hamas threw away ceasefire chance' Jump to media player Israeli government spokesman Mark Regev says Hamas "threw away" a chance for a ceasefire after it rejected a proposal for a truce with Israel. Palestinians reject Gaza ceasefire Jump to media player Egypt says it has not received an official response from the Palestinians to its proposal for a ceasefire in Gaza. 'Essentials, not luxuries' in Gaza Jump to media player Yolande Knell reports from a market in Gaza, where stall holders say people are buying ''essentials, not luxuries''. Obama urges peace in Gaza Strip Jump to media player President Obama has called for "peace and security for both Israelis and Palestinians" at a speech in Washington. 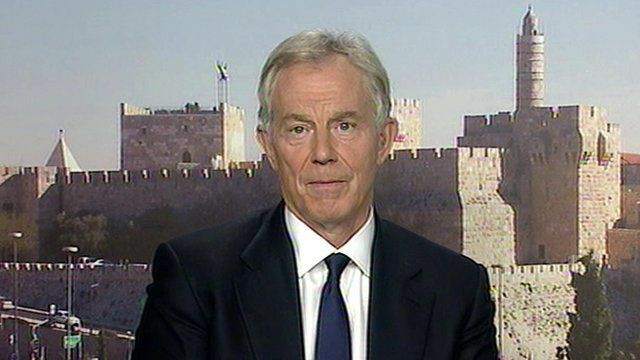 "Time is running out" to resolve the Gaza conflict according to Middle East peace envoy Tony Blair. He was speaking to BBC News after Israel resumed its air strikes on Hamas-controlled Gaza. Israel had briefly held its fire, after accepting an Egyptian brokered ceasefire - but the armed wing of Hamas rejected the initiative. Mr Blair - who urged the Egyptian president's involvement - said it was "frustrating" as the plan had included a long-term solution for Gaza.